Making Your Own Chocolate would be one small example of our passions at Mabel. I started making chocolate years ago for my kids after reading what was in commercial Easter Bunnies. I learned it was very fast to make and much better chocolate for my family at a fraction of the price. Now, they demand I make some as a holiday tradition. Far easier than making cakes and cookies! Once you learn a few basics, you will never forget how to do it. This page aims to keep it simple. Click here for our melt and pour molds. 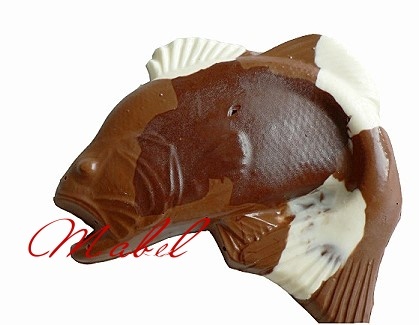 We even have chocolate spoon molds, and the spoon itself is chocolate! In a pinch? Advice: NEVER buy "dipping chocolate" if you need to dip because they do not taste good and are full of cheap wax fillers. Good old fashioned Nestle chips have the best content if you need chocolate to dip and is probably priced lower anyway. 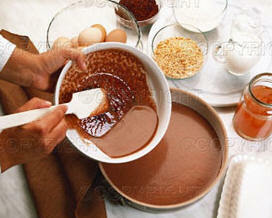 Add a touch of oil if you need more fluidity, such as with chocolate fountains. Chocolate is oil based. You can add oil based food grade flavors, FYI. Click here for a fun TV DVD Video we produced. To make high quality chocolate you would buy what the professionals call "coins" or "wafers." They come in Dark, Milk Chocolate and White Chocolate. White Chocolate actually has no Cocoa in it. It consists of mainly cocoa butter, a commodity we are already accustomed to working with at Mabel. Click left photo to see our real mocha spoons! 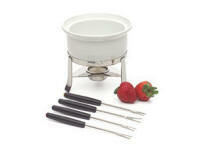 Our chocolate is also perfect for fondue sets and chocolate fountains, when we carry it in season. 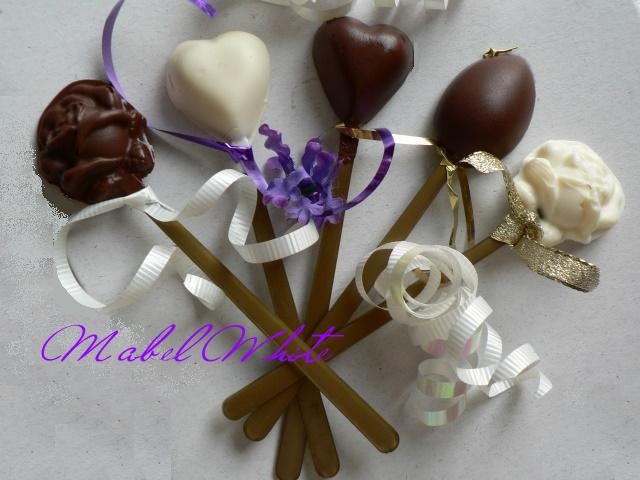 The quality melt and pour chocolates we use come already mixed, so we know we are working with dark, milk or white. The difference is we know our final ingredients are not loaded with paraffin wax, or other cheap fillers to keep it firm and cut price corners. Click here for our DVD Video! Chocolate Truffles have to be the most expensive to buy an easiest to make in your own home. Retail, they cost at least $1 if not $5 each in the Chocolate stores. When you make your own truffles they cost around .43 cents to make at the most. We just melt and pour using the microwave for most techniques. This topic is so powerful--we have waited a very long time to endeavor. Why? We love it so much we would have to eat some just to write about this easy and rewarding craft. And we knew it a year ago. Filming the "How to Make Chocolate DVD" was mesmerizing enough. With holidays nearing, it would be wise to learn how to make this simple melt and pour divine treat and recipients will always be putting you on their radar for more. It only takes minutes, yet guests assume you must have knocked yourself out. Chocolate is by nature oil based. When making chocolate, any of our flavor oils mix in well, such as Raspberry, Strawberry, and my all time favorite Key Lime. If Willie Wonka and the Chocolate Factory did not inspire you as a child, the movie Chocolat (2000) was proof I could fall in love again with just this project. Click here for our DVD Video! Storage of Chocolate: Most companies do not ship to sell bulk chocolate during the summer months because shipping trucks can exceed 140 degrees inside. Typically they stop shipping from April to October as we do. If shipped mid-summer, the recipient most likely receives a warm pound plastic bag of chocolate instead of coins, wafers, bars. Some companies will sell, as long as a waiver is clear. When making chocolate we keep the room under 70 degrees. Chocolate is very sensitive to temperature and humidity. Ideal storage temperatures are between 15 to 17 Celsius (59 to 63 Fahrenheit), with a relative humidity of less than 50%. Florida, for example, is very humid, exceeding 80% humidity outdoors, at times. Chocolate should be stored away from other foods as chocolates can absorb different aromas. Ideally, chocolates are packed or wrapped and then placed in proper storage areas with the correct humidity and temperatures. Putting chocolate in a refrigerator is not a good idea unless you have no A/C under 70 Degrees. The Cocoa Butter will float up and make it look funny. Still good--just an appearance issue. If you want to know why some chocolate is way better than others, by our own Chef Greg Engelhardt, do click here. Click our one pound Bass to show your husband you can clean a fish! Great for guys gifts. Click here for our melt and pour molds.